WOW Airlines: What’s it Like to Fly to Europe for $99? I was in the market for a low-cost, round-trip ticket to Europe so I was excited to see WOW Airlines advertise $99* one-way tickets to Europe from select US destinations (Boston and Baltimore). After verifying that WOW was a legitimate airline, I booked my ticket. I booked a five-day, $450 round-trip ticket from BWI (Baltimore – Washington DC) to London Gatwick. My experience on the plane was wonderful given the bargain I received on the plane ticket. WOW can offer such cheap airfare because it charges a fee for EVERYTHING else. For $450 I received a seat (not a reserved seat) and could bring an 11 lb carry-on onto the plane. I could have paid a $96 fee to add an additional 15 lbs to my carry-on and an additional $24 fee to reserve a seat for the entire trip. If you travel with just a backpack (as I did), then 11 lbs may be sufficient. WOW is likely pretty strict with weight limits (since the livelihood of the airline depends on fees), so I would recommend double checking the weight of your bag before arriving at the airport. It is also important to note that all flights layover in Iceland, which means that you can only get about 3-4 hours of sleep on each leg of your flight. The map below shows WOW’s destinations. The planes themselves were nicer than expected–I expected WOW to operate planes that had risen from an airplane graveyard during some sort of seance. Thankfully that was not the case. WOW flies two types of planes (A320-200 and A321-200) and I flew both types on my trip to London. I stepped onto the A321 and it looked like a TWA plane from the 80’s! 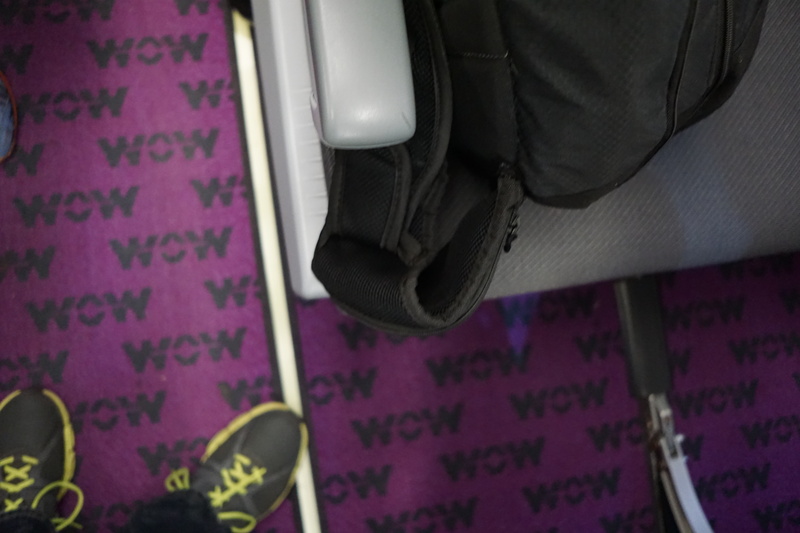 Bright purple logos everywhere (see the photos below) and the cute flight attendants wore matching purple outfits. I didn’t get a picture of the flight attendants, but they were beautiful and appeared to enjoy talking to everyone about life in Iceland. The plane was relatively new and I had enough leg room that my knees didn’t touch the seat in front of me. My seat reclined with no issues. The A320-200 was an older plane and it was not nearly as nice as the A321. 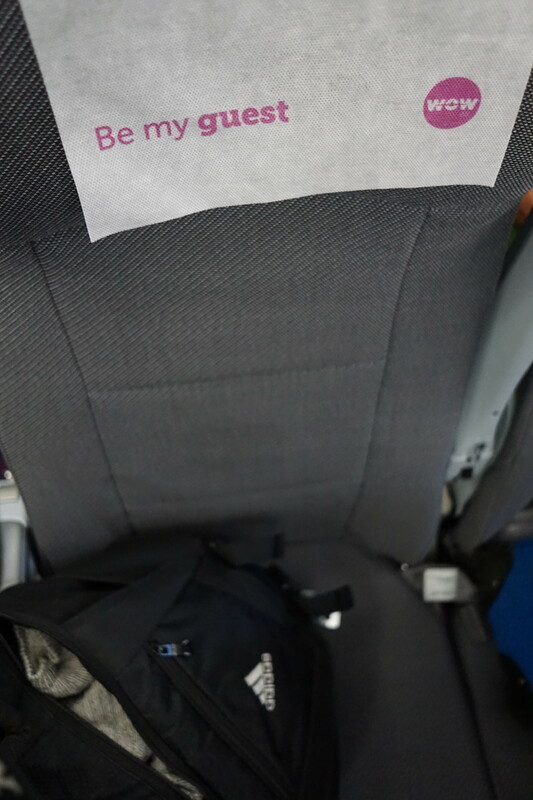 The interior did not contain the same bright purple logos and the seats offered less leg room. My knees touched the seat in front of me and my seat struggled to fully recline. Unfortunately, I was exhausted from traveling so I didn’t snap a picture of the inside of the plane; however, I did manage to get a picture of the outside (see below). Ordering food was an ordeal. The credit card readers were not connected to the internet so only credit cards that could be swiped offline worked. Only one of my three credit cards worked (Citi AAdvantage) and of course it wasn’t the one that charged no foreign transaction fee (Citi recently eliminated the foreign transaction fee on this card). Overall the food was good and the price of the food was reasonable. It’s worth noting that you can choose whether you want to pay in cash (USD) or with a credit card (Icelandic dollar-Krona). My credit card offered a much better exchange rate (even with the 3% foreign transaction fee) than WOW, so I paid with my card. If you notify your credit card company that you’re traveling internationally, do not forget to mention that you’ll be in Iceland. The flight had a little turbulence but both aircraft reached their respective locations in one piece. The outbound plane arrived late to BWI so my departure was delayed by over three hours. Unfortunately the terminal only had one restaurant and one convenience shop (no lounges) so it wasn’t the best place to spend three hours waiting. The delay gave me an opportunity to chat with the Iceland-based flight crew and pilots about my upcoming trip. Would I fly WOW Airlines again? Probably not. While it was a perfectly wonderful experience for $450, I would rather pony up the extra $200 for either an American or British Airways ticket that comes with frequent flier miles (! ), lounge access (elite status), direct flights, free meals, better seats, in-flight entertainment centers, a free checked bag (more with elite status), free reserved seats (elite status), better drink options (for purchase), and more convenient flight times/ locations. With that being said, I would not hesitate to fly WOW again if I cared less about the above perks. Be the first to comment on "WOW Airlines: What’s it Like to Fly to Europe for $99?"